Lieutenant General Duncan J. McNabb is Deputy Chief of Staff for Plans and Programs, Headquarters Air Force. In that position, he is responsible for the development, integration, evaluation and analysis of the Air Force Future Years Defense Program, which exceeds $642 billion, and the Air Force Long-Range Plan to support national security objectives and military strategy. The general is responsible to the Secretary of the Air Force and the Chief of Staff. 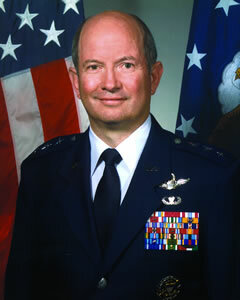 After graduating from the Air Force Academy in 1974, McNabb has held command and staff positions at squadron, wing, major command and Department of Defense levels. These positions included duties as chief of the Logistics Readiness Center with the Joint Staff, where he was responsible for operational logistics and strategic mobility support to the Chairman of the Joint Chiefs of Staff and the Secretary of Defense. During operations Desert Shield and Desert Storm, McNabb commanded the 41st Military Airlift Squadron, which earned the Military Airlift Commandâ€™s Airlift Squadron of the Year award in 1990. McNabb commanded the 89th Operations Group, where he oversaw the air transportation of U.S. leaders, including the president, vice president, secretary of state and secretary of defense. He then served as commander of the 62nd Airlift Wing. McNabb also commanded the Tanker Airlift Control Center, where he was responsible for the planning, scheduling and execution of a fleet of more than 1,400 aircraft in support of combat delivery and strategic airlift, air refueling and aeromedical operations around the world. Prior to assuming his current position, McNabb was the director of programs with the Office of the Deputy Chief of Staff for Plans and Programs. He also served as chairman of the Air Force Board and had oversight of all Air Force programs. McNabb was interviewed by MAT Editor Harrison Donnelly. Q: You have spoken about transformation as the only way for the Air Force to meet the demands on it during a time of tremendous pressure on the nationâ€™s fiscal resources. What are these pressures, and how can the three components of transformationâ€”organization, concepts of operation [CONOPS] and technologyâ€”help resolve that dilemma? A: Beginning in the year 2010, youâ€™re going to see close to 30 million baby boomers retiring and coming onto the books for Medicare and Social Security. At the same time, you only have 10 million new wage earners joining the workforce, putting tremendous stress on the nationâ€™s fiscal resources. Consider this stress with the need to prepare for a continually evolving threat, and the only way the Air Force can meet its responsibilities is by transforming. For the Air Force, transformation serves the common good. Everybody wants more from the Air Forceâ€”whether itâ€™s our joint enablers, kinetic kill, air supremacy or expeditionary combat support. For us, that is a blessing and a curse. A blessing because everybody loves us and needs us and wants us, and a curse because everybody loves us, needs us and wants us. So what we have got to do is to balance our overall portfolio so that a dollar spent for the Air Force is spent wisely, and we can be good stewards of the taxpayersâ€™ trust. We say that transformation incorporates technology, CONOPS, organization and, most importantly, the people that bind them all together. Managing all these elements in a smart and cohesive way is the key to getting the most bang for the buck. The Joint Direct Attack Munition [JDAM] is a good example of what technology can do for your portfolio. Itâ€™s a $20,000 GPS modification to an iron bomb already sitting in the inventory. Using the 500-pound JDAM version, one B-2 can hit 80 different targets in a single sortie. During Vietnam, destroying 80 targets required, on average, 2,400 sorties and 14,000 gravity bombs. Technology is also driving changes in fundamental force structure. We are modernizing to a fleet built around stealth, unmanned and long-range-strike technologies, while retiring substantial numbers of legacy aircraft. This will reduce the total number of tails in the inventory and save on long-term operations and maintenance costs. However, the total capability of this force will increase, whether measured in aim points struck per day or tons of cargo delivered per day. Now, we marry these new platforms and technologies to new CONOPS. And transformational CONOPS will have to be joint CONOPS, closing the seams among the services. Done right, they will yield a more productive application of technology to create effects. For example, if the Army and Marines can rely more on airborne indirect fires, they can save on artillery. And a lighter, faster Army can, in turn, make the Air Force more lethal by expanding our awareness at the ground level. So innovation drives innovation. Next, we marry technology and CONOPS to an expeditionary organization. Not a larger Air Force, but a more expeditionary Air Forceâ€”in two years, weâ€™ve improved from 34 percent of the active duty postured to deploy to 75 percent of it postured to deploy. Weâ€™re also integrating our active, Reserve and Guard into a total force to take advantage of the comparative strengths of each component, allowing us to deploy forces abroad without eroding readiness at home. In a nutshell, I guess you could say transformation will allow us to produce more effects with fewer forces. Or, as we like to say, the effects of mass without massing forces. Q: â€œJointâ€� warfighting has already paid big dividends in Afghanistan and Iraq, where weâ€™ve witnessed a powerful, if still evolving, marriage of airborne firepower with maneuvering ground forces. What is the Air Forceâ€™s plan for pushing forward on this front? A: The Secretary of the Air Force and the Air Force Chief of Staff have pronounced full integration with land forces to be one of our key focus areas. In simple terms, our plan is to take the mature relationship weâ€™ve developed with the Special Operations Forces [SOF] and replicate this with the Army, Marines and eventually our coalition partners. Special operators have learned how to leverage the multiplying effects of airpower through years of training and practice. We saw the culmination of this in Iraq, where 1,400 SOF operators working with dedicated airpowerâ€”strike aircraft, C4ISR, search and rescue, airliftâ€”controlled the whole western half of the country, an area roughly the size of Georgia. This SOF/USAF task force effectively paralyzed 11 Iraqi divisions, securing the left flank for the main Army/Marine thrust to Baghdad. By working closely with the Army as it transforms, we intend to breed the same kind of interdependence with conventional infantry and armor. Weâ€™ve made a lot of progress to date: The Air Force was there to provide close air support for every step of the 300-mile race to Baghdad. In fact, as air and ground forces close the seams between them, â€œclose air supportâ€� becomes an inadequate definition of the relationship, because the line between â€œsupportedâ€� and â€œsupportingâ€� is always shifting. Roles become more flexible and adaptive. When the Army was halted by the five-day sandstorm last March, the Air Force took the baton and continued the offensive against Iraqi Republican Guard units trying to reposition under cover of weather. We destroyed the Medina division, Saddamâ€™s best heavy division, south of Baghdad and helped clear the way for the Third ID. In the close urban combat weâ€™re seeing in places like Fallujah, though, the Marines are the spearhead and our role is to provide supportâ€”very lethal, precise fires with AC-130s and F-15s, but support nonetheless. Ultimately, we build new technologies and new operational concepts in the service of building something even more critical: trust. When the Marines are saying, â€œI can trust Air Force air, they have a failsafe mechanism to make sure the weapon goes to where the target is,â€� and when the Army says, â€œI can trust Air Force air, it is going to be there when I need it,â€� well, it changes the way you go about warfare. When our sister services start to have the confidence to reduce forces in reserve, because they know that we will be there, it not only allows them to reprioritize those critical resources, but also changes the nature of warfare. Youâ€™re seeing inklings of that now, with the Armyâ€™s increased willingness to rely on Air Force operational fires. Thatâ€™s not just a cascading effect. Thatâ€™s transformational. Q: Do you have specific programs or technologies in the works to make this happen? A: Programmatically, we are demonstrating our commitment to land forces by making priority investments in close air supportâ€”meaning airborne platforms, sensors, munitions and â€œbattlefield airmen.â€� The last is a new term that enfolds several existing specialtiesâ€”including combat controllers, pararescuemen, tactical air control partiesâ€”basically, all the airmen we have on the ground working with the Army, Marine Corps and SOF. The archetypal image is the guy on horseback with a laser range finder around his neck and the computer bouncing from his saddle, calling in air strikes from B-52s at 39,000 feet. In a way, the need for new labels reflects our focus on capabilities; we realize that transforming air-to-ground precision fires will require a broad, ground-based skills set as much as new aircraft, munitions and communications. The battlefield airman initiative is actually a great example of how we are uniting technology, CONOPS and organizations to produce transformation. In terms of technology, we are developing the Battlefield Air Operations Kit. This will cut the operatorâ€™s load in half while giving him faster sensor-to-shooter links, with pure machine-to-machine interfaces and longer-lasting power sources. He will have mini-UAVs to extend his awareness bubble. Our CONOPS is for this airman to bring the heavy firepower to bear for a special forces squad, infantry company, Stryker platoon or whatever, operating far forward with not much support. Heâ€™s artillery in a rucksack. So having him at the right place is only half the equation. He has to have instant and persistent access to a stack of aircraft overhead, with a range of weapons available, so he can call in the right effect at the right time. Our goal is for him to designate a target up to 10 kilometers away, automatically relay precise targeting coordinates to the shooter, and receive a confirmation message with an expected time of weapons arrival. This is a new way of operating, a new way of thinking, and it requires a new way of organizing. We need to consolidate all our battlefield airmen into a family of warfare specializationsâ€”just like we have a family of airmen called â€œpilots.â€� We need to provide a common organizational and training structure. And we absolutely have to do this in a joint fashion. Lots of joint training and exercises, so the next generation of airmen, soldiers, sailors and Marines will have worked together, will know what each is bringing to the fight, and will already have the processes worked. And, most importantly, they will already have the trust in one another to take the whole team to a different level. Inevitably, this will feed upon itself, leading to greater and greater capability. Q: What about the airborne side of close air support [CAS]? The A-10 has served as the real â€œdown and dirtyâ€� close air support platform in Afghanistan and Iraq. What is the future of the aircraft, and do you foresee a manned replacement designed for the low-altitude environment? Is this a role the Joint Strike Fighter [JSF] will fill? A: We approach future CAS from a capabilities-based perspective, which means we want to have a balanced portfolio of aircraft, sensors and weapons that can evolve over time. In the longer term, there will be a huge role for UCAVs [unmanned combat aerial vehicles] and perhaps newer technology like directed energy. In the near term, weâ€™ll continue to infuse legacy platforms with state-of-the-art technologiesâ€”think of the newfound relevance of a B-52 equipped with datalinks and precision bombs. By â€™08 or â€™09, every fighter and bomber aircraft will be JDAM capable. We want to establish more robust ground moving target indicator coverage of mobile targets across the battlespace and couple that with the command and control and information grid to really compress the kill chain. The A-10 will serve for years to come in the niche, low-altitude role. We will preserve a still-to-be-determined number of aircraft in the best condition, giving them a service-life extension, including re-engining. We have fully funded a precision-engagement upgrade to give them smart weapons, data links and advanced sensors. Itâ€™s a great asset, itâ€™s a real workhorse, and itâ€™s actually very pertinent in a close fight. Remember, we want to have a portfolio of capabilities. You can either come in and do up-close close air support, or you can loiter up high and bomb from a relatively safe distance, out of range of RPGs and shoulder-fired SAMs. The modernized A-10 fleet will provide a bridge until the JSF enters service. We are currently exploring the potential of the JSF CTOL [conventional take-off and landing] and STOVL [short take-off/vertical landing] variants to assume the CAS mission. Q: When you talked about improvements in timely fire support, you mentioned â€œkill chain compression.â€� What is the process or system that will allow the Air Force to put steel on target in shorter time frames? A: Our effects become much more decisive if we can put cross hairs on the target in minutes rather than hours. The kill chain is a cycle with discrete steps: find, fix, track, target, engage and assess, where â€œtargetâ€� is the point when youâ€™ve put the cross hairs on something. Now, weâ€™re already pretty good at a lot of these steps individually. We can find and track targets on the ground with our space sensors and aircraft like Joint STARS. We can target them with pinpoint accuracy. We can engage them with some very effective weapons. But we need to speed up the hand-off between steps to make this happen fluidly. Getting the cross hairs on the target is the culmination of an awful lot of other things that have to go right. In other words, itâ€™s the sum of the parts that has exponential effect. Compressing the kill chain is really a command and control problemâ€”an information management problem. That doesnâ€™t sound very glamorous. So our focus right now is on the air operations center [AOC] as a weapons system, treated just like a combat platform. Itâ€™s in the AOC that the compression is achieved: it takes in the multitude of intelligence and information streams and allows the commander to filter, decide and act. Once you can manage your information efficiently, youâ€™ve achieved operational speed. Then itâ€™s just a matter of managing your tactical assets in time and space. With our long-range bombers, we can put targets at risk from a great distance, anywhere on the globe. We can also keep them above an area of operations for a long time, loitering and waiting for target coordinates to be fed up, so they can respond in minutes or even seconds. Q: Precision fires are just one example of the joint force commanderâ€™s growing demand for Air Force capabilities. How do you plan to ensure the necessary supply of enabling capabilities across the board? A: Letâ€™s talk about joint enablers. Air Force investments in joint enablersâ€”meaning space, C4ISR, aerial refueling and mobilityâ€” have grown from about 33 percent of our budget in the Cold War to about 45 percent today, and will grow in the future to about 47 percent of our top line. We are very good stewards of these capabilities. We make the case for them on behalf of all the services, because they are the capabilities that make the whole team better. They really drive joint transformation. We saw a very good example of that in Iraq. During the race to Baghdad, the Third ID and the First Marine Division were not only betting on our ability to kill things, they were also betting on our ISR to reveal what was going on around them, and they were betting on our communications and GPS satellites to link dispersed forces together and enable them to orchestrate complex maneuvers across difficult terrain, at night and through sandstorms. Ultimately, this sensor umbrella had an exponential effect on the ground forcesâ€™ organic lethality, because they had the ability to see first, shoot first. The Army is transforming toward smaller brigades and wants to deploy them anywhere on the globe in a matter of days. They are going to be looking for much more support from the Air Force than ever before. They will have to move exclusively by air to meet some of their timelines, and they will need high-fidelity situational awareness and â€œkillâ€� support to survive. So a smaller, lighter Army will put more, not fewer, demands on Air Force resources, but again, we will have dramatically increased joint effect. Q: It is apparent that as transport and tanker airframes are retired, the Air Force is not seeking a tail-for-tail replacement. With the planned investment in future mobility platforms, where will you be capacity-wise? A: Let me first say that the mobility fleet has performed exceptionally well since 9/11. During operations Enduring Freedom and Iraqi Freedom, 26 percent of all the cargo was transported by air. In the past six months, 15 percent has been transported by air. Over 800,000 tons of cargo were transported during OEF/OIF. Only the Berlin Airlift [1948-1949] exceeds it in terms of number of missions and tonnage flown. As we plan for the future, we are thinking about the sum of capabilities that we need, rather than the sum of tails. Capacity and capability, as opposed to total aircraft, are better strategic mobility metrics. Todayâ€™s fleet provides a lift capacity of approximately 45 million ton miles per day [MTM/day]. C-5 modernization and C-17 procurement will enable us to meet the current strategic mobility requirement of 54 MTM/day by 2012. And thereâ€™s more to the story than ton-miles of cargo. Prior to SEALOC closure, the strategic airbridge is absolutely critical, as it is the only way to get to the fight. After SEALOC closure, the strategic airlift requirement goes down while the theater airlift requirement goes up, as we move forces from the ports forward. The C-17 happens to be a very good swing asset from phase to phase. Prior to SEALOC closure, the C-17 can do the strategic lift; after SEALOC closure, it can swing to the theater lift problem, landing on short, unimproved runways while employing the defensive systems and tactics to survive the threat environment. This gives the customer â€œfort to foxholeâ€� direct delivery. With tankers we are also keeping in mind the needs of our sister service customers. Obviously, tankers are not bought just for us. In Afghanistan, the service that really needed the tankers was the Navy. In effect, it gave them legs they have not traditionally had before. One of the things we are trying to do with the modernization of the tanker fleet is to take advantage of commercial industryâ€™s tremendous advances in fuel efficiency and overall capability. The KC-10, which is 88 percent common with the Boeing DC-10, is a good example. It has always been one of those airplanes the Navy really likes to have because of its large capacity, integral boom and drogue capability, and its ability to be refueled itself. It is the mother ship, continually topped off by other tankers to serve as a persistent airborne gas station. A wide-bodied commercial airframe is our recapitalization target for the future and the quickest way to get the right tool in the hands of the warfighter. Essentially, it will be like having mini KC-10s, and literally could change the way we do tanker operations in support of warfare. Q: How does the F/A-22 fit into this picture? Itâ€™s not an enabler in the sense youâ€™re using. Itâ€™s not a long-range strike, CAS or SOF enabler. A: I consider the F/A-22 to be a level above an enablerâ€”itâ€™s more like a prerequisite for fighting in distant, dangerous places. And, remember, our focus is on capabilities, not specific systems. More than any other capability, combat commanders from the other services are depending on the Air Force to dominate the skies. Only by having air supremacy do they have real freedom of maneuver, freedom from aerial attack, and thus the ability to seize the operational initiative. Can you guess when was the last time the United States lost ground soldiers to enemy air attack? Well, it was April 15, 1953, involving two members of an anti-aircraft unit in Korea. Because weâ€™ve excelled at air dominance for so long, sometimes we take it for granted that it will always be there. At the same time, we have fundamentally transformed the F/A-22 to the era in which we find ourselves. The Air Forceâ€™s future is closely linked to the missions of our Army, Marines and special forces, requiring the flexibility to rapidly and precisely engage enemy ground forces in the close fight, conduct battlefield interdiction and attack command and control targets. The transformation of the F/A-22 from strictly an air-to-air platform to one of the worldâ€™s most advanced air-to-ground strike systems will give our combatant commanders that capability. If you consider the F/A-22â€™s supercruise, its radar signature, the altitude that it flies at and its firepower, I would say there is nothing that is being developed in the Department of Defense that can compete. And if you did develop it, it would probably look very similar to the F/A-22. We have looked at the double-digit SAM threat and other anti-access threats that are proliferating very rapidly. We have looked at the tradespace between the F/A-22 and other capabilities. In the end, no other asset allows us to open up the door for the rest of the joint team the way the F/A-22 does. If you were a business, you would never take risk in the most critical element of your strategy. Q: Finally, youâ€™ve said that the next two years are a pivotal moment in the U.S. militaryâ€™s transformation. Decisions made now will have ripple effects over the next 20 years. As the Air Forceâ€™s strategic planner, what are your top priorities for anchoring Air Force transformation in the months ahead? A: I would say that the next year or two represent a once-in-a-generation opportunity to reshape not only our Air Force, but also the entire U.S. military for the future. Iâ€™ve called it the perfect storm, because the Quadrennial Defense Review [QDR], the Base Realignment and Closure [BRAC] process and an election are all coming together at the same time. But even if you are in a storm, you still have a lot of great opportunities. It can be a creative as well as a destructive force. Take, as a great example, the literal sandstorm during the race to Baghdad. The Iraqi Republican Guard chose poorly in its attempt to exploit the storm by moving their forces, thinking they were invisible. We could see every move the Iraqis made and had the power in place to kill them. It was a turkey shoot. We made the best of the opportunity. Likewise, this perfect storm offers us great opportunity. We need to figure out what force structure we can best design that meets the demands of the national strategy but stays within the fiscal resources available. Once we have that force structure, we run it through BRAC to make sure we have the infrastructure tailored to that new force structure. We also take that force structure and organize it with the Future Total Force to ensure we use our active duty, Guard, Reserve, civilian and contractor work force effectively. Then we submit it in the QDR. We understand the missions we need to perform for the combatant commanders. We endeavor to make short-range decisions that are consistent with long-range CONOPS. We are evaluating our future force structure using these CONOPS, and we are making operational and risk assessments of the systems that give us the capabilities to support those needs. That doesnâ€™t mean that the plan wonâ€™t change, as the world changes, as inevitably other variables change. What makes it real dicey is a global war on terrorism that consumes our current resources and will continue to do so while we are trying to transform. We donâ€™t get to shape our Air Force or our military very often, and we have to make sure we do it right.